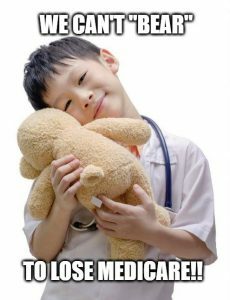 (October 18, 2016) We Can’t “Bear” To Lose Medicare!! The London Health Coalition is launching a Care Bear Tour today on Tuesday, October 18th. With a giant teddy bear, aptly nicknamed “Tommy”, the coalition seeks to convey the message that care (not profit) must be the centre of our public health care system. Their goal is to spread awareness of the Charter Challenge occurring in British Columbia, brought by private profit-seeking clinics who want to maximize their profits by billing OHIP or their province’s equivalent and by billing patients on top for hundreds or thousands of dollars for tests and surgeries. The future of our public health care system that ensures equal health care for all is being threatened as this legal suit could bring down the laws that serve to protect patients against extra-billing and user fees by private clinics. If the clinics win, the very wealthy will buy their way to the front of the line, doctors’ time will be increasingly used to provide unnecessary care for the rich, and wait times will increase for most Canadians as money and scarce health professionals are taken out of our public hospitals to private profit-seeking clinics serving the wealthiest. We must take a stand to protect our public health care system that prioritizes patients based on medical need and not on wealth. Please feel free to share the attached flyer with friends, colleagues and neighbours to spread awareness about these important issues for all Canadians!